In nature, termite colonies are essential to the well-being of an ecosystem. Since they eat the cellulose found in plant matter, they play a crucial role in breaking down forest debris and speeding up decomposition. Although termites may appear fragile with their soft, fleshy bodies, they make up for their lack of exoskeleton by living below ground and keeping a very low profile. They feed on wood, which they find by digging an elaborate network of tunnels. Unfortunately, in many parts of Long Island wood framed houses can be more abundant than forests. The high water table here also puts our houses in the path of termites. There simply isn’t much space below ground for termites to occupy. When these factors are combined with humid coastal weather and plenty or rainfall you have the recipe for a high infestation zone here on Long Island. According to the Sentricon website over 5 million homes are damaged annually by termites, accounting for roughly 5 billion dollars’ worth of damage. Termites are the silent assassins gnawing through both a house’s structure and its value, and they often go undetected. 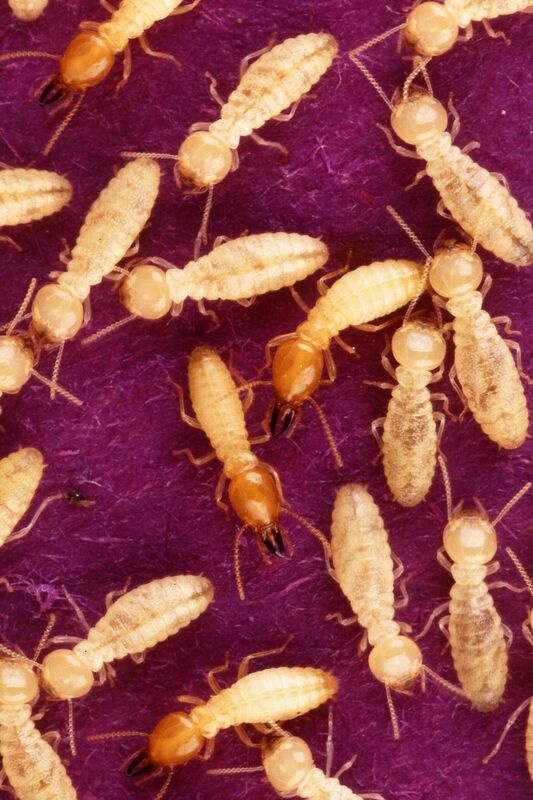 Although uncovering tunnels burrowed into the wood frames of a house is clear evidence of termite activity, the surefire sign that there is an active infestation is the presence of winged swarming termites in the spring. In recent years, however, the termite sub species found in New York is changing its behavior and no longer swarm out in the open en mass as they once did. The reason for this change is still not exactly clear to the scientific community, although global warming is a likely culprit. The lack of swarming does not mean that termites have disappeared or decreased in number. It means that although termites continue to gnaw through houses as before they have become even harder to detect. This is why it is especially important to have houses inspected upon buying or selling them. Have a New York State certified professional exterminators conduct a thorough inspection if there is reason to believe that there may be termites in your home. One thing that separates Arrow from other operators is our progressive method for termite elimination. Many other exterminators still use an intrusive, messy, much less “green” method that involves creating a barrier of chemicals extending into the soil around the house. This requires drilling holes through the concrete every 8 inches all around both inside and outside the house, as well as digging a trench around the perimeter. After that, literally hundreds of gallons of chemicals are pumped into the soil through the holes and trenches. This type of treatment is not designed exterminate the whole termite colony, but instead protects the property with a layer of residual pesticides all around the area and into the footings of the structure. Of the over 100 exterminating companies in New York, there are only a handful that are certified as Sentricon specialists, including Arrow Exterminating. Termed the “colony elimination system”, Sentricon offers a more environmentally friendly and far less intrusive alternative to the traditional method of termite control. There is no need for drastic measures such as pumping hundreds of gallons of pesticides into the ground. Instead bait stations are introduced around the property containing small samples of wood treated with a compound that inhibits growth in developing termites. Since termites are social insects, they often nourish each other by regurgitating meals and sharing the food with their compatriots. The juvenile hormone found in the bait stations is quickly spread this way. The immature termite nymphs that are fed the bait are no longer able to molt, or mature. The effect is slow acting, so the termites cannot detect the source of the disruption and continue to feed from the bait stations. Over time the colony sustains enough damage that it will be eliminated. The treatment is far more environmentally friendly, and has won awards as a “green” pesticide solution. It is used to treat famous landmarks and national treasures such as The White House, The Statue of Liberty, and The Alamo. The Sentricon method of termite control is proven to be extremely effective, especially when administered by the skilled professionals at Arrow Exterminating. We have been licensed Sentricon operators since 1996, and after over 17 years administering this product we understand that the system is only as effective as the operators who use it. Although the manufacturer recommends checking the traps a minimum of one time after installation, we come back at least 3 times throughout the year to ensure customer satisfaction. Eliminating termites is an investment in a home’s value and the obligation of any responsible homeowner. Hopefully after perusing through all of this information it is easier to make an informed decision about termite control and the choices for treatment are clear. This entry was posted in Uncategorized and tagged Arrow Exterminating, home improvement, Pest control, Sentricon, termite behavior, termite treatment, termites on October 11, 2013 by ArrowBugBlog. your efforts and I am waiting for your further write ups thank you once again.